Slightly pink on the inside, a lightly flame-charred exterior, and plenty of runny juices — the perfect hamburger is a marvel to behold. But does a cow have to suffer for you to enjoy one? California-based plant-based meat substitute company Impossible Foods has a definitive answer to that: absolutely not. The company is inching closer to becoming indistinguishable from the real thing with its brand-new 2.0 burger revealed today at the Consumer Electronics Show (CES) in Las Vegas. “I couldn’t tell it wasn’t the real thing,” wrote CNET‘s Dara Kerr, who tasted the new burger. Impossible Foods’ technology is called “heme,” an iron-carrying molecule that the company claims is what gives meat its distinctive flavor. Its Impossible Burger is now on sale at over 5,000 restaurants, including chains like White Castle, just over two years after the company’s founding. 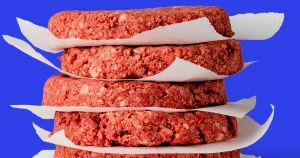 Alongside its new burger, Impossible Foods announced today it is planning to sell its plant-based meat substitute “meat” in grocery stores across the country by the end of 2019 — a big step for the burgeoning industry. And Impossible isn’t the only player in the high tech meat substitute game. Other companies, like Beyond Meat, have also extended offerings to grocery stores, like Beyond’s plant-protein-isolates-based Beyond Meat burger. Nonetheless, the better the options, the more likely it is that the trend will actually catch on. And that’s inherently a good thing: there’s plenty of evidence that the industrial meat industry is terrible for our planet.